Two common questions for those not already in the know are ‘what are the different types of forklift trucks?’ and ‘what are the differences between them?’, so we’ve put together a short guide on what the different types of forklifts are and why it can be important to know the difference. These are the most common form of forklift truck – the one you’re probably picturing in your head whenever you imagine a forklift truck. Available in gas, diesel and electric powered models, the trucks are counterbalanced with rear weight so that the weight of the load at the front can be carried. On this type of truck, the forks come out from the front and there are no outrigging legs or arms, which enables the truck to be simply driven up to the load, without the need for a reach facility. 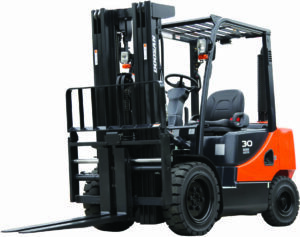 This type of forklift truck works on the same premise as the standard four wheel counterbalance truck, but the wheel in the rear centre of a three wheel truck allows for greater manoeuvrability. Three wheel models don’t have the same weight capacity as four wheel models, but they are better for use in tight spaces, as the design of the truck gives them a smaller turning circle. They are ideal for racking loading, either inside or outside. Reach trucks are designed to operate in narrower spaces than a traditional counterbalance forklift. The trade-off for the increased narrowness of the forklift is a decrease in the turning radius, making reach trucks a little harder to manoeuvre around the warehouse. Another key difference is that the driver always sits sideways in a reach truck, where with most other forklifts they would face forwards. As the name suggests, the primary benefit of a multi-directional truck is its versatility. It is suitable for warehouse managers who need a truck for a wide variety of differing tasks, that would typically require a few different types of trucks. Multi-directional trucks can move the lifting mechanism, and the truck itself, in any direction – even diagonally. This makes it the perfect truck for anyone with unpredictable workplace demands. A Narrow Aisle Truck is – as you might suspect – a truck that’s specially designed to operate in tight spaces; specifically spaces narrower than 12ft. They are especially useful for warehouse managers who need to store a lot of stock in a small warehouse space. These are trucks designed to move palletised loads of up to 3,500kg. Incredibly simple machines to operate, the operator simply slides in the forks and pumps the handle by hand to raise the pallet off the floor. The front wheels, which are mounted on the ends of the forks, stay on the floor, while the forks themselves are separated from the wheels and raised up through the pumping mechanism, giving the pallet the clearance it needs. Due to how this type of forklift truck works, the clearance to the ground is very slight – just enough for the pallet to be moved. With an incredibly similar operation to the hand pump pallet truck mentioned above, the only real difference with the electric pallet truck is that the forks are lifted using an electric mechanism which is powered by battery, rather than by hand. This gives higher clearance, but means that the battery needs to be recharged – this can often be done directly from the mains power, depending on the specific truck design. The truck is easy to operate and is moved forwards or backwards using a paddle. A button is pressed to either raise or lower the load. Considered to be a more specialist forklift truck than the others, tele hander forklifts feature an extending mast, operated using a boom, in place of the traditional straight masts that are seen on other types of forklift truck. The design of this truck means it offers incredible access.